Samuel Gravely was born in Richmond, Virginia on June 4, 1922. He attended Virginia Union University for three years, where he was a member of Alpha Phi Alpha, the first intercollegiate fraternity established for African Americans in 1906. Postponing his education, he enlisted in the Naval Reserve in 1942 where he trained as a fireman apprentice. In December of 1944 Samuel Gravely was commissioned an Ensign following his successful completion of a rigorous Midshipman education known as the V-12 Program. During his officer education he attended the University of California at Los Angeles, Pre-Midshipman school in New Jersey, and Midshipman school at Columbia University (New York). On the day of his graduation he became the first African American commissioned as a Naval Reserve Officer. For his first assignment, Officer Gravely was stationed at Camp Robert Smalls, where he served as the Assistant Battalion Commander for new recruits. Shortly thereafter, beginning in 1945 he served aboard the USS PC-1264, a segregated submarine chaser. In April of 1946 he was released from active duty, during which time he returned home to Richmond, recommencing his studies at Virginia Union University. In 1948 he completed his undergraduate education, earning a Baccalaureate degree in History. On July 26, 1948 President Harry S. Truman issued Executive Order 9981, desegregating the United States military. As a result, the following year Officer Gravely was recalled to active duty and was assigned as a recruiter. Stationed in Washington, D.C., he recruited among the local African American community. Following his assignment as a recruiter, Officer Gravely was stationed aboard the Battleship Iowa and then the Cruiser Toledo where he served as a communications officer during the Korean War. In 1955 Officer Gravely was transferred from the Naval Reserve to the regular Navy. In 1962 he was promoted to Commander of the United States Ship (USS) Falgout (DER-324), which patrolled the Pacific Barrier between the Aleutian and Midway Islands. In May of 1970 Samuel Gravely became Commander of the USS Jouett (DLG-29), which remained active throughout the Vietnam War. While serving as Commander aboard the USS Jouett, in July of 1971 Captain Gravely was elevated to the appointment of Rear Admiral. 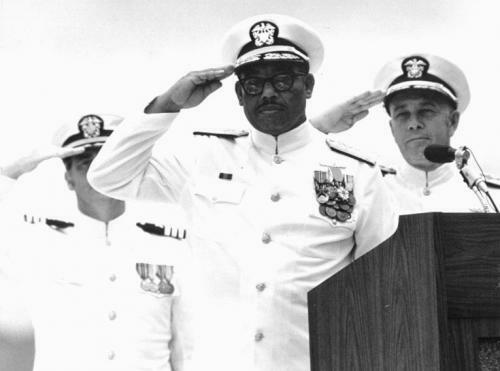 In September of 1976 Vice Admiral Gravely was promoted yet again, this time by President Richard Nixon to assume control over the entire Third Fleet. As the Third Fleet Commander, he oversaw all operations on 100 Navy ships, and was in command of 60,000 sailors and marines stationed at Pearl Harbor, Hawaii. For his final tour of duty, beginning in 1978, up until his retirement in 1980, Vice Admiral Gravely served as Director of the Defense Communications Agency. As Director he oversaw the communications network linking Washington, D.C. with allied bases throughout the world. Altogether, Vice Admiral Gravely served 38 years in the Navy. Scheduled for delivery in 2008, the Arleigh Burke-class missile destroyer DDG-107 has been named in his honor. Vice Admiral Samuel Lee Gravely died on October 22, 2004 at the National Naval Center in Bethesda, Maryland due to complications from a stroke. Henry E. Dabbs, Black Brass: Black Generals and Admirals in the Armed Forces of the United States (Charlottesville, Virginia: Howell Press, 1997); http://www.arlingtoncemetery.net/samuel-gravely.htm.